I've just had another research study published, this time in the Journal of Digital Imaging and has just been published online ahead of the print edition. The article presents a mathematical formulation to the supervised learning problem and demonstrates its application in the computer-aided diagnosis of breast cancer from MRI screening examinations of high-risk women. The article is copyrighted by Springer, the journal's publisher, so I can't reproduce it on Spotlight-on-Science, however, you can access it from their website here. The article presents a general purpose formulation of the supervised learning problem where the algorithm is provided with example measurements of breast cancer lesions from MRI screening examinations and also provided with measurements from radiologically suspicious benign lesions. The algorithm then predicts whether new samples belong to either the malignant or benign group. Such a system can act as an aid in the breast cancer screening process. 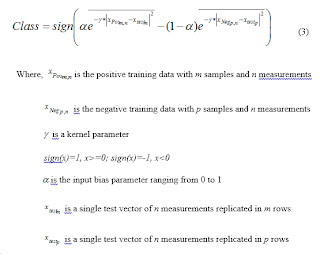 The article's presented approach to supervised machine learning is a mathematically defined solution which makes use of the radial basis function. This proposed machine learning equation is compared with the established support vector machine (SVM) and is demonstrated to outperform the SVM when applied to the diagnosis of radiologically suspicious lesions in this application. The paper was authored in collaboration with colleagues of mine in Canada (at Sunnybrook Health Sciences Centre and North York General Hospital). The article also focuses on basing the machine learning process on measurements of vascular heterogeneity and demonstrated that most of the traditional separation between malignant and benign lesions based on lesion enhancement dynamics is obtainable from the vascular heterogeneity information extracted from the first time point post contrast agent injection. The amount of separation between malignant and benign lesions also degrades as the vascular heterogeneity is assessed later on in the examination (which is not surprising as factors such as contrast agent diffusion will cause the examination to appear less heterogeneous later on in the examination). 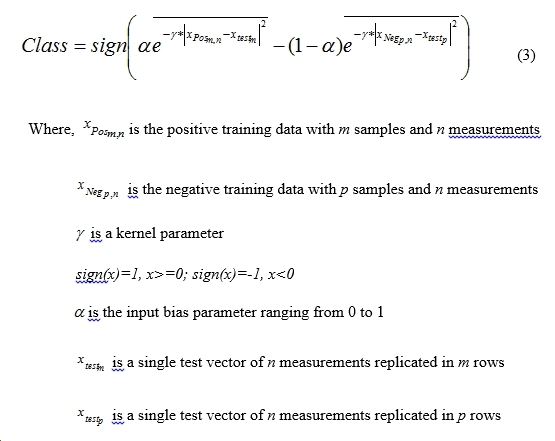 For those interested, the following two equations cover the normal way of performing machine learning with the support vector machine (bottom equation of the two) using a radial basis function kernel (top equation of the two). · J. Levman, E. Warner, P. Causer and A. Martel, “A Vector Machine Formulation with Application to the Computer-Aided Diagnosis of Breast Cancer from DCE-MRI Screening Examinations,” Journal of Digital Imaging, DOI: 10.1007/s10278-013-9621-8.